"In less than two years we've brought the number of helicopters connected to Airbus Helicopters from zero to nearly 550," said Matthieu Louvot, Executive Vice President, Customer Support & Services for Airbus Helicopters. "We're pleased that helicopter operators are seeing the value that data sharing and analytics promise, such as fewer operational interruptions, greater cost competitiveness, increased safety, and better anticipated maintenance actions, and we're confident that this number will continue to grow." Helicopter data sources currently shared with Airbus Helicopters include Airbus' Helionix avionics suite; Health and Usage Monitoring Systems (HUMS); and Fleet Keeper™ digital logbook, among others. New data sources have recently joined the ranks, such as helicopter maintenance data thanks to agreements Airbus Helicopters has signed with four MRO software providers: MRX Systems, Rusada, Ramco and Traxxall. The 550 connected helicopters include almost every helicopter type in Airbus' range – H125s, H130s, H145s, H155s, H175s, H215s, and H225s, among others – performing a wide variety of missions including emergency medical services (EMS), public services, tourism, training, private and business aviation, oil & gas and search and rescue. 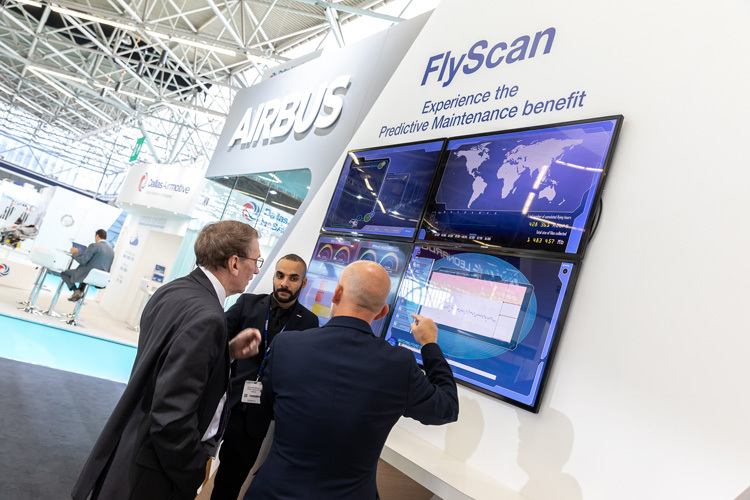 One example is FlyScan predictive maintenance services, in which Airbus Helicopters analyses HUMS vibration data and proactively recommends when to replace a component before faults occur, limiting Aircraft on Ground (AOG) situations, increasing availability, and reducing the maintenance burden. Since FlyScan's launch in 2017, 10 operators with 44 aircraft have subscribed to FlyScan, resulting in the ability to prevent approximately one AOG per year per customer. Airbus Helicopters' comprehensive digital service offer features SmartForce for military helicopters and Skywise for civil helicopters, both adding value for customers through data driven intelligence.